A technical issue which grounded most of the historic aircraft that make up the Battle of Britain Memorial Flight (BBMF) has been identified. A Lancaster bomber, two Hurricanes and three Spitfire planes were all grounded earlier this month. An issue with a pinion gear in the Merlin engine has now been found. Sqn Ldr Andy Millikin, the flight's commanding officer, said they were now working to "get them back into the blue as soon we can". The aircraft were grounded after a routine inspection identified an issue, can regularly be seen in the skies at air shows and military events. An issue with a pinion gear, part of the drive train that transmits power from the engine to the propeller, was identified this week. In a statement posted on Facebook, Sqn Ldr Millikin said: "My aim is to keep these vital and unique artefacts of Britain's proud history in the sky forever. "To do that we sometimes have to take extra precautions... to ensure that we can keep them flying for future generations." One of the planes is the last remaining airworthy Spitfire which flew in the Battle of Britain, and the Lancaster is one of only two left flying in the world. 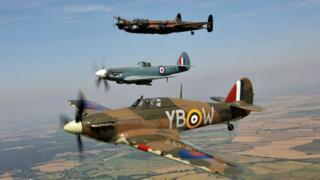 They are scheduled to appear at the first ever air show at RAF Scampton, which is due to be held on 9 and 10 September. The flight also marked its 60th anniversary earlier this year with an air display attended by its patron, the Duke of Cambridge.